On 11th March 2014 it will be exactly three years since the devastating Tōhoku earthquake and tsunami [東北地方太平洋沖地震] destroyed part of north-eastern Japan. This event changed people’s lives in just one moment and resulted in large-scale loss of lives, with many others displaced and made homeless. Over the past few years Japan Centre and our generous customers have donated over £27,000 to the relief effort helping those effected get back on their feet. This year we will again place donation boxes at our checkouts from 4th March, the proceeds of which will go directly to the continuing relief effort. This year many events are taking place over the coming months to raise money and / or awareness for continued support to the devastated area, below we detail them. 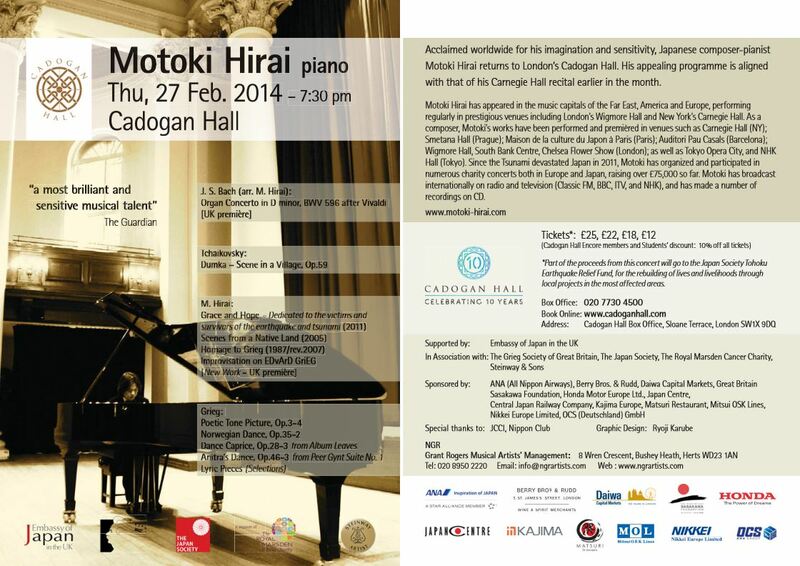 In Aid of the Japan Society Tohoku Earthquake Relief Fund, world renowned pianist Motoki Hirai returns to Cadogan Hall, London, Thurs 27th February 2014 at 7:30 pm. Described as “a most brilliant and sensitive musical talent” by The Guardian, his recital is aligned with that of his Carnegie Hall recital the same month and includes his own compositions such as critically acclaimed Scenes from a Native Land and Grace and Hope, dedicated to the victims and survivors of the earthquake and tsunami. This will also be the UK premiere of his latest work Improvisation on EDvArD GriEG, dedicated to the Norwegian composer Edvard Grieg whom the second half of the programme features. You can win tickets to the recital, see below for details. *Part of the proceeds from this concert will go to the Japan Society Tōhoku Earthquake Relief Fund, for the rebuilding of lives and livelihoods through local projects in the most affected areas. Motoki Hirai himself has been very kind and provided Japan Centre customers with the opportunity of winning 5 pairs of competition tickets to his recital. All you have to do is answer the following question in the comment section below, or by replying to our Facebook Motoki Hirai post or dedicated competition tweets. To be in with a chance of winning please tell us: What’s your favourite piece of classical or modern music? Competition winners must be able to make their own way to and from the concert and will be contacted via email, facebook or twitter by Monday 17th February. Closing date Friday 14th February. Joji Hirota & Hokusai Orchestra London host two remembrance events, one on March 11th, a half-hour spiritual gathering in the morning and the other on 29th March where there will be an evening concert with music from both Japanese and European origins, moving through sadness into hope, growth and happiness. The morning event will be connected to other European commemoration events happening simultaneously in London, Coria del Rio Spain, Aoba Castel Miyagi Prefecture , Thuson-ji Iwate Prefecture and Nakamura Shrine Fukushima Prefecture. NTT Europe Limited will support the network so that all can pray and sing whilst being linked around the world simultaneously. Joji Hirota is a Japanese taiko drummer, composer, multi-percussionist, shakuhachi player, and singer born in Hokkaido, the northern island of Japan. In the early 80s, he founded ‘Joji Hirota & London Taiko Ensemble’, a highly regarded and well established Japanese traditional and contemporary taiko drumming group. Now his career spans over 30 years and 16 albums, sculpting dynamic landscapes of rhythm and haunting melodies with the themes of nature and the beauty in everyday life. Supporting Joji is Akiko Ohtomo a conductor born in the devastated area of Fukushima, Japan. 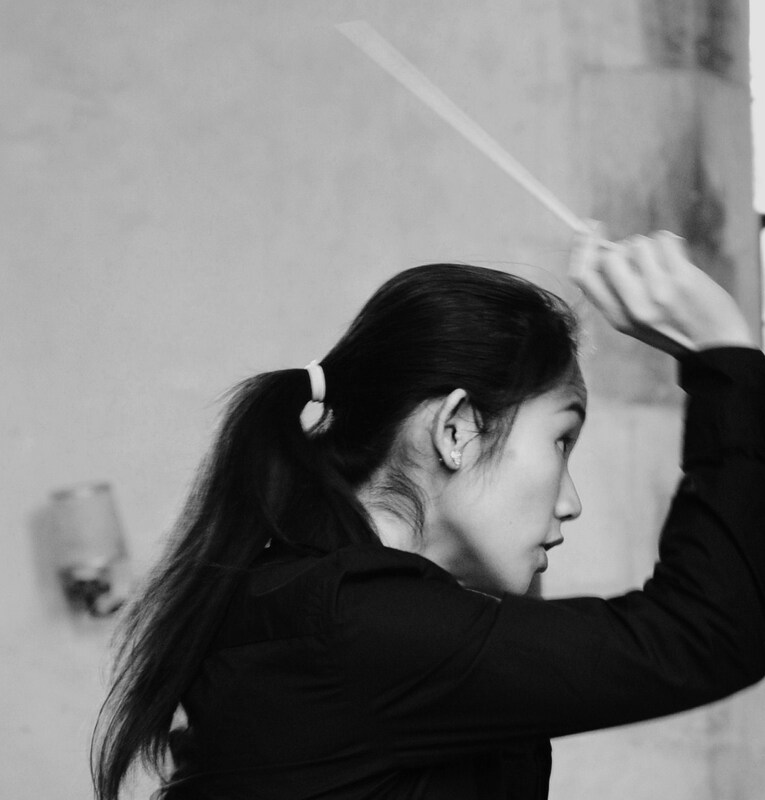 Akiko studied Music and Conducting in Tokyo, also working during that time as an assistant conductor to Mstislav Rostropovich in Kobe; and to Naoto Otomo for an opera ‘Jr.Butterfly’ by Shigeaki Saegusa at the 52nd Puccini Festival in Italy. To further her postgraduate studies she moved to Russia’s St Petersburg State Conservatory where she was a fellowship student of 20th Zonta International. In 2005 she was awarded first prize at the International Academy of Advanced Conducting Competition in St.Petersburg. After moving to the UK she established the Hokusai Orchestra London drawing on the gifts and energies of young professionals and introducing Japanese traditional music and instruments. This student-run event in March raises money for Aid for Japan, a charity that provides support and therapy for children orphaned in the 2011 earthquake and tsunami disaster. Sheffield Japan Day aims to provide the opportunity to experience and enjoy Japanese culture whilst raising money for a good cause. 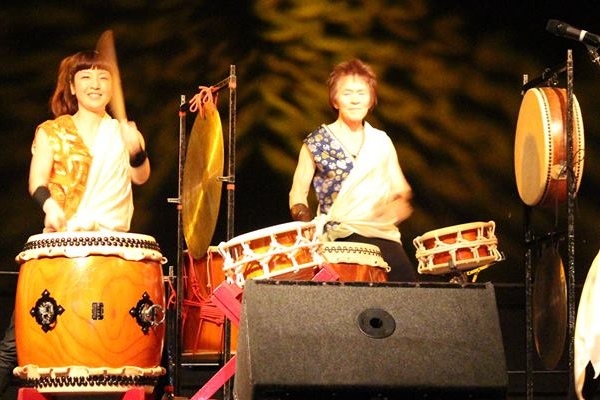 Join the event and enjoy performances from the Mugen Taiko Drummers, the London Okinawa Sanshinkai and the SOAS Min’yō Group. Guests will also have the chance to have their photo taken in kimono, tuck into Japanese food from local business Edo Sushi and try their hand at calligraphy, ikebana, shibori and other activities. All proceeds of the event will be donated to Aid for Japan. Posted in Uncategorized and tagged hyper japan, Tohoku. Bookmark the permalink. One of my favourite pieces of music is Concierto de Aranjuez by Rodrigo. Beethoven’s Ode to Joy, in the Ninth Symphony. Congratulations you have won a pair of tickets to the Motoki Hirai concert! We will be in contact shortly. “Gabriel’s Oboe” composed by Ennio Morricone. So sad, but I think it has a shade of hopefulness too.